PINGDINGSHAN, Henan -- Even though Wang Meilian's wheat field has had no water for more than 110 days, she always managed to stay calm. "I thought the rain would come eventually," the 45-year-old said. "There's always some rain." 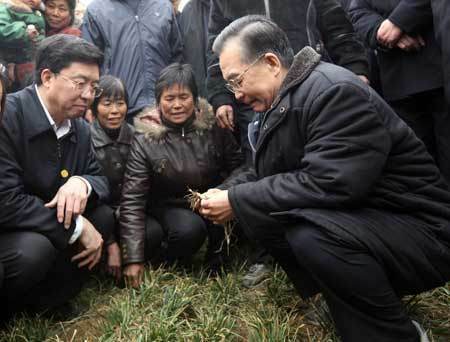 Although her home province of Henan is suffering the worst drought in half a century with a 90 percent drop in average rainfall since last November, Wang said she was never too afraid. Her native Pingdingshan city is rich in black (coal), white (salt) and blue (water) resources. As the dry spell spread over town, so did relief efforts by local cadres and residents. With widespread fog since early Saturday, meteorological reports of a rainfall that evening and local preparation of artificial precipitation, it was only natural for the villager to assume all was going to be well. But when Wang woke up with no sight of rain on Sunday outside her house, she realized the time to irrigate the fields was now or never. "We started at 6 a.m.," she said in the winter chill, watching her 15-year-old son taking his turn at watering their field with a water pipe. "The rain would've saved us a lot of effort. But it hasn't been of much help, and forecasts are now saying it's going to be sunny again from tomorrow on. "It's not that we just wanted to wait for the rain," she continued. "It was too cold these past few months. And since drought relief work started, it's been difficult to borrow water pumps." While slight showers and artificial precipitation brought an average of 0.5 mm of rainfall to 17 counties and cities in Henan yesterday, Pingdingshan received virtually no rain at all. "About half of our wheat will be lost this year no matter what we do," local water resources chief Dong Fagen told China Daily. "And to be very frank, we can only manage to irrigate at best 2 million mu (133,333 hectares) of Pingdingshan's total 3.06 million mu (204,000 hectares) of farmland. "The rest is up to Mother Nature," he said.